The Codeverse studio in Chicago. Courtesy of Dan Kelleghan Photography. Codeverse, which bills itself as the world’s first interactive classroom and technology platform designed to teach coding to kids 6 to 12, officially opened its flagship studio in Chicago today. The studio is at 819 W. Eastman St. in Lincoln Park. 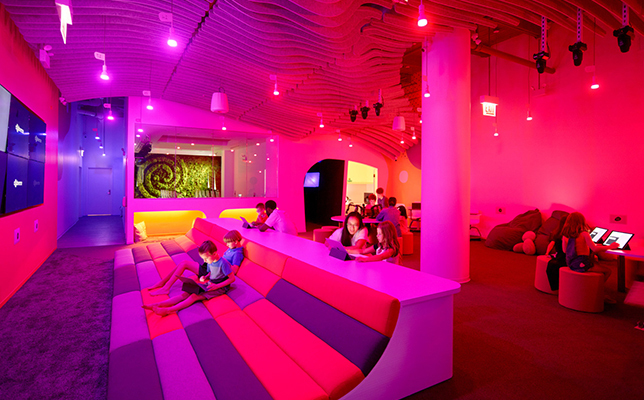 Codeverse is housed at a 3,600-square-foot space that offers a number of high-tech features, including a 20-foot TV wall, 3D printers, robotic arms, “hackable” lights, drones and speakers — which can all be controlled and/or programmed by kids using KidScript. Codeverse is offering weekly classes and summer camp sessions for children 6-12 years old. The organization says it expects to enroll 200 kids in its summer camp program this year, and interact with thousands of additional students through the end of the year at its Lincoln Park site. Next year, Codeverse anticipates opening three additional studios in Chicago, the company said in a news release. Monthly membership at Codeverse is $225, which provides kids with recurring weekly access to the Lincoln Park studio, as well as exclusive access to KidScript at home. Codeverse’s summer camp costs $800, which covers one week of coding and activities. Camps run from 9 a.m. to 3 p.m., Mondays-Fridays, during the following weeks: Aug. 7-11 (sold out), Aug. 14-18, Aug. 21-25 and Aug. 28-Sept. 1. During this week only, Codeverse is offering a $250 discount if you sign up during one of the above weeks. Visit the company’s website to register or for more information. Codeverse was founded by husband and wife duo Craig Ulliott and Katy Lynch. Their friend Dave Arel is a third partner. To read more about the company and its founding, read this THE Journal article.